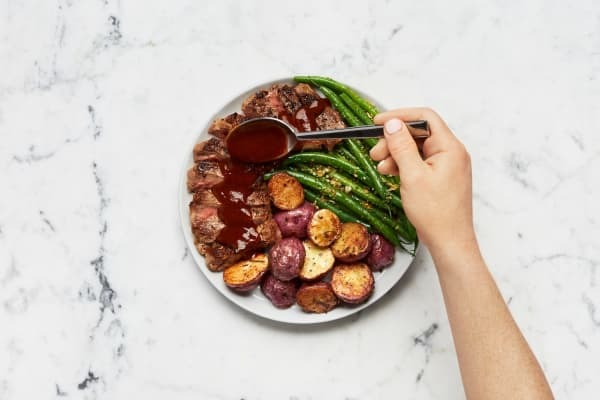 Le menu: Seared sirloin drizzled with savory pan glaze. 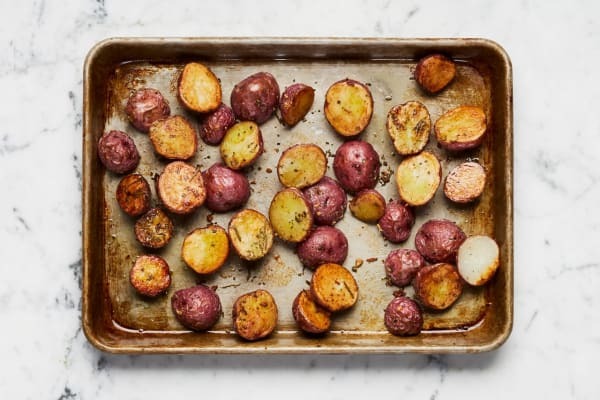 Roasted rosemary-scented potatoes. 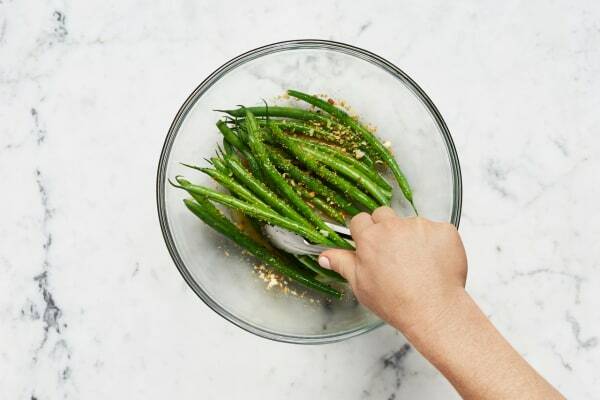 Buttery green beans topped with garlicky toasted bread crumbs. Your upcoming restaurant reservation: cancel that! Adjust rack to upper position and preheat oven to 425 degrees. Wash and dry all produce. Halve potatoes. Pick rosemary leaves from stems; mince leaves until you have ½ TBSP. Mince or grate garlic. Trim green beans. 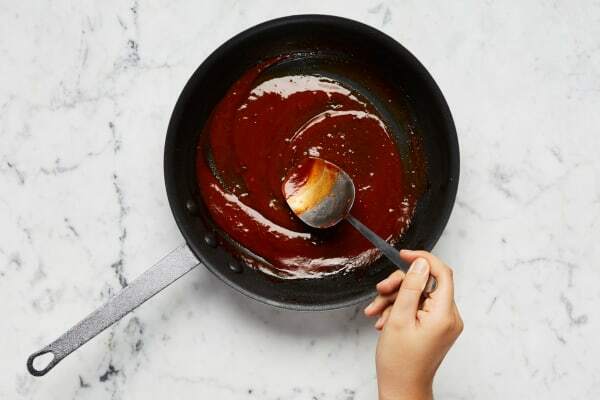 In a small bowl, combine stock concentrate, ketchup, mustard, 3 TBSP water, ¼ tsp sugar, and hot sauce (to taste). 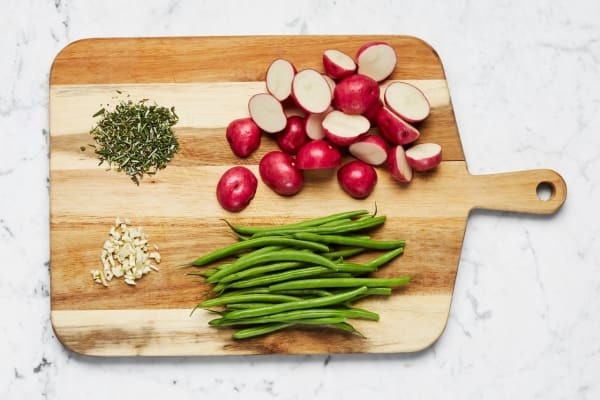 Toss potatoes in a medium bowl with a drizzle of oil, minced rosemary, and a large pinch of salt and pepper. Arrange cut sides down on a lightly oiled baking sheet. Roast until browned and tender, 25-30 minutes. 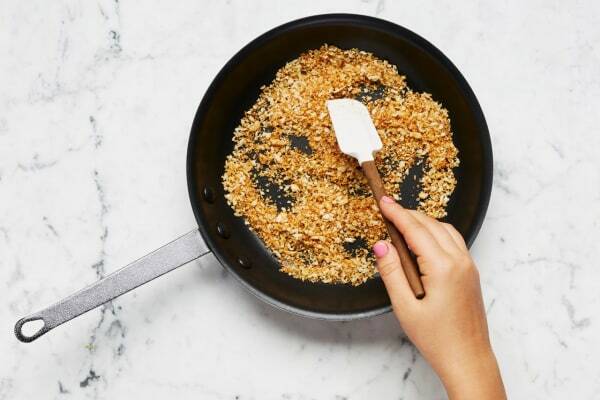 Melt ½ TBSP butter in a large pan over medium-high heat. Add garlic and cook until fragrant, about 30 seconds. Add panko and cook, stirring constantly, until golden brown, 3-5 minutes. Season with salt and pepper. Remove from pan and set aside. Wipe out pan. Pat steak dry with paper towels; season all over with salt and pepper. Heat a large drizzle of oil in same pan over medium-high heat. Add steak and cook to desired doneness, 4-7 minutes per side. Remove from pan, tent with foil, and let rest until ready to serve. Reduce heat to low. Stir in sauce until thoroughly combined. Remove pan from heat; season with pepper. While steak cooks, place green beans in a medium microwave-safe bowl with a splash of water. Cover bowl with plastic wrap and poke a few holes in wrap. Microwave on high until tender, 2-3 minutes. Remove from microwave, drain water, then toss beans with 1 TBSP butter. Season with salt and pepper. Toss with garlic panko. 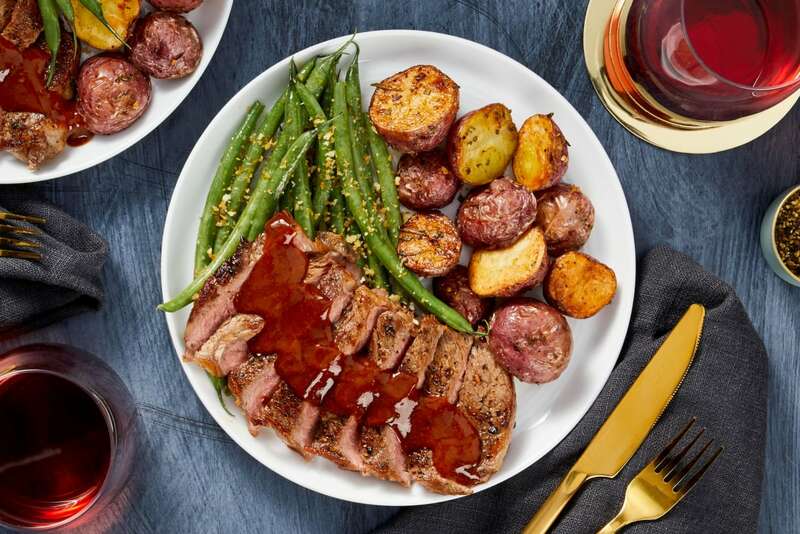 Divide steak, potatoes, and green beans between plates. Top steak with sauce.